This Pink Lemonade Cake from scratch tastes like summertime! 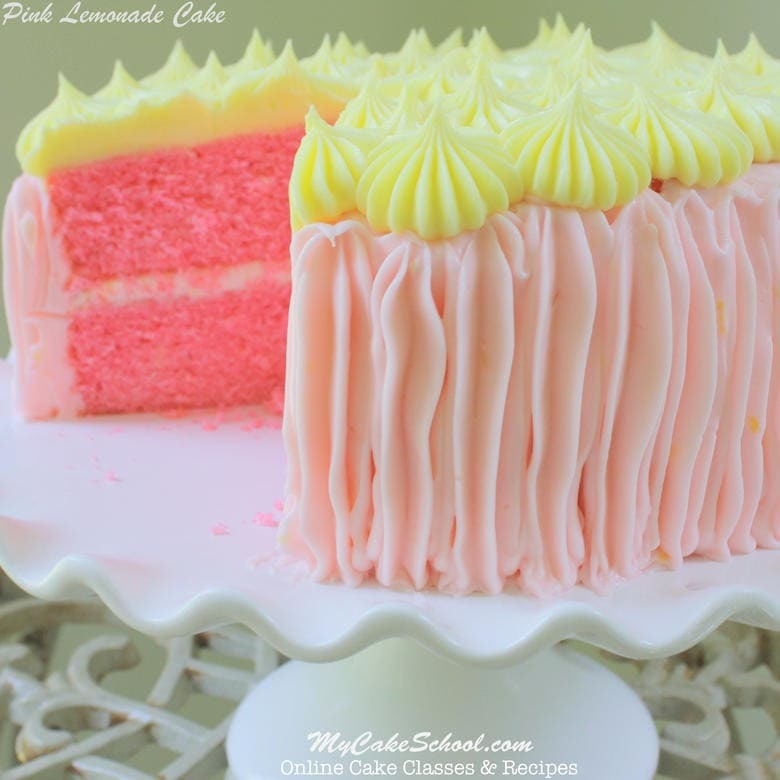 I just love the uniqueness of this recipe and flavor– Pink Lemonade Cake isn’t a dessert that you see too often, but it should be! Just one bite and you will be convinced. This amazing cake belongs in your recipe file of favorites! As someone who loves all things lemon, I was so excited to add this recipe to our collection! Unlike our popular Lemon Cake recipe (which we also love), this Pink Lemonade Cake has an extra boost of tartness from frozen Pink Lemonade concentrate. This is a cake flavor that both kids and adults will love! 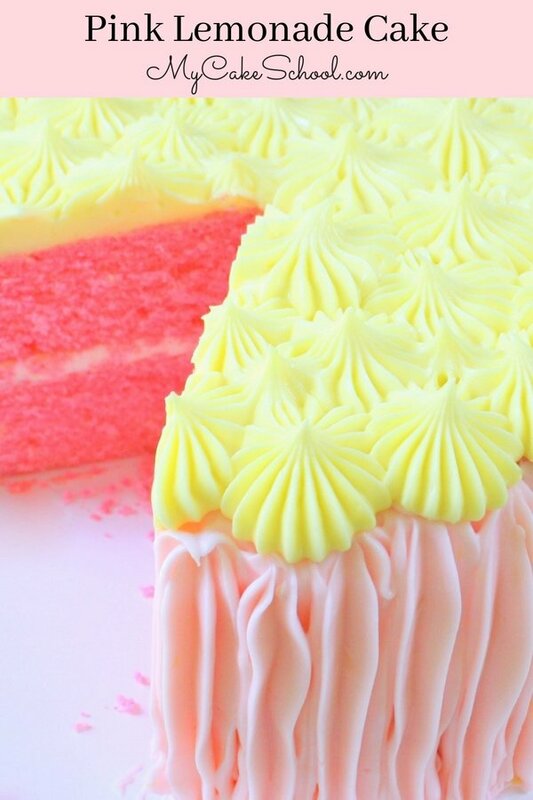 We decided to frost our pink lemonade cake layers with our lemon cream cheese frosting. It compliments this flavorful cake perfectly, making it a dessert that we will turn to for summertime gatherings for years to come. In fact, I have a feeling that I’ll be making this cake year-round…it’s just that good! Like many of our scratch recipes, this cake is made using the Reverse Creaming Method of mixing. This method refers to the order that ingredients are added, which is a bit different than the traditional way. Cakes made with the reverse creaming method are slightly denser, and have a wonderful velvety quality. We go over all of the mixing details clearly in our Recipe, but if you’d like a bit more information, we have a free cake video tutorial on the method here! : Reverse Creaming Method of Mixing. 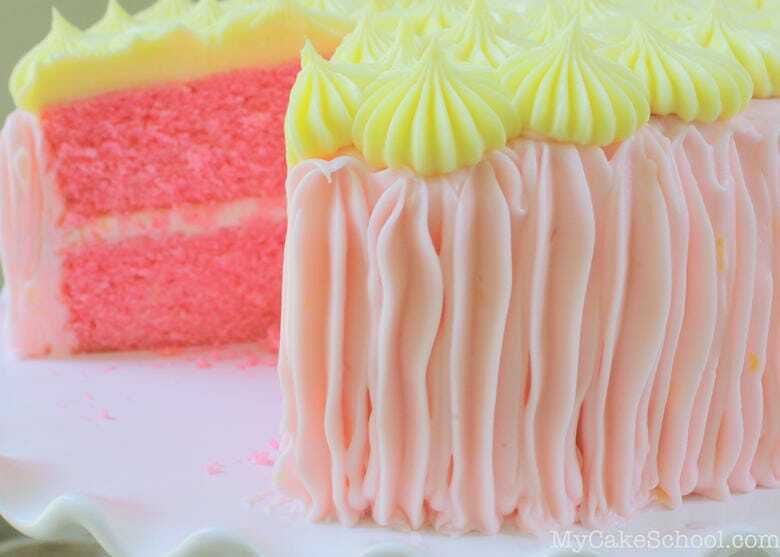 As we mentioned above, we frosted our Pink Lemonade Cake with one of my favorite frostings: Lemon Cream Cheese Frosting. This luscious Lemon Cream Cheese Frosting is so easy to make and perfect for so many cake recipes (vanilla cake, white cake, lemon, coconut, and more)! 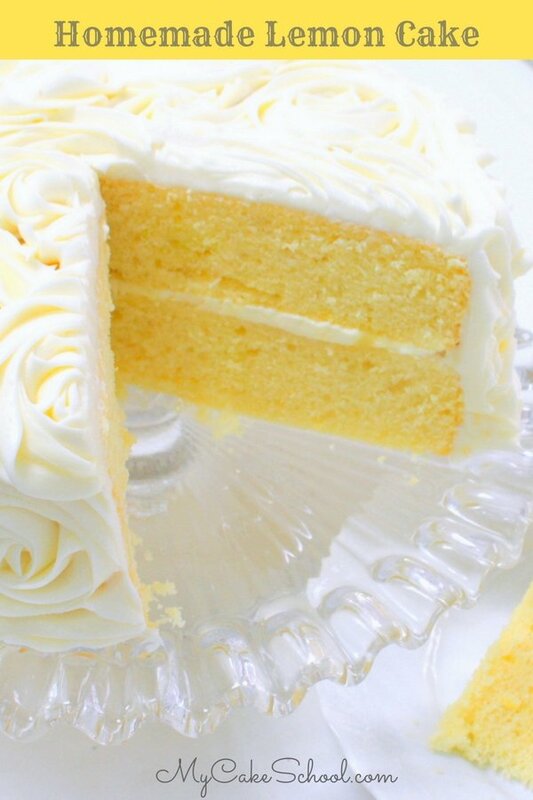 Click here to find the recipe: Lemon Cream Cheese Frosting. Method is important when using Reverse Creaming. With the mixer on low speed SLOWLY ADD 1/2 of the egg mixture, increase to medium speed for 1 1/2 minutes. The batter will become thick and fluffy. Scrape the bottom and sides of the bowl. ADD THE PINK GEL COLOR, Add the remaining egg mixture in 2 pourings, beating for 20 seconds after each addition. * The Decoration: To decorate the cake, I filled the cake layers with our Lemon Cream Cheese frosting recipe, and then frosted a thin crumb coat. Then, I used a 2D piping tip to pipe vertical lines around the sides, piping from bottom to top all the way around. Then, I used a french tip (Ateco 869) to pipe stars all over the top with the lemon cream cheese frosting. I love this simple style of decorating! So quick, easy, and inviting! I wish I had a slice right now. *When working with cream cheese frosting, it it is likely to become soft more quickly than buttercream (especially if your kitchen or hands are warm). If you notice that it becomes too soft to easily pipe or hold it’s shape, chill it in the refrigerator for a few minutes. You can even alternate between two piping bags if you’d rather. 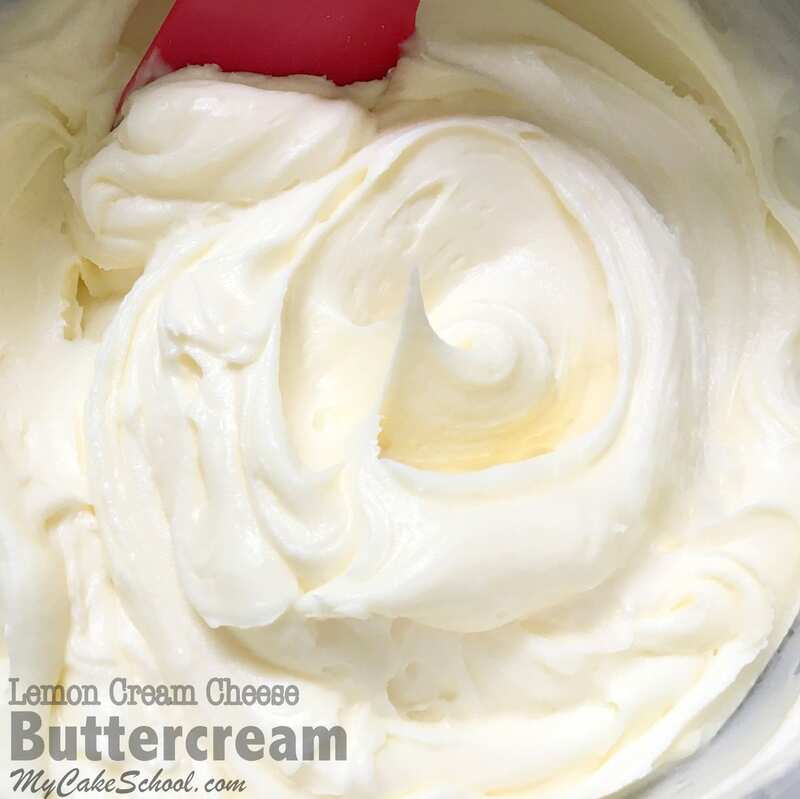 This Lemon Cream Cheese Frosting Recipe is fantastic! Find it here: Lemon Cream Cheese Frosting. Did you know that we also have a fabulous Lemon Cake Recipe from scratch on our site? It’s another great choice and definitely one that everyone should have in their recipe file! You can find it here! : Lemon Cake Recipe from Scratch. Thanks for stopping by! Make sure to check out our full collection of FAVORITE cake and frosting recipes in our Recipes Section! You can also find all sorts of fun, free cake decorating tutorials in our Free Cake Tutorials Section! Hi Tammie, Yes, I think it would be the same measurement as the lemonade. The only cake we have made with alcohol is the Pink Champagne Cake recipe. Good luck, let us know how it goes. Hi we don’t have frozen lemonade concentrate in the uK. Can you tell me what I can use as an alternative please ? If you can not get Pink Lemonade just use the regular lemonade (the pink color just comes from raspberry juice so you could add up to 10 drops of liquid red food coloring for just the right amount of pink color). This is a great cake!!! I made this recipie twice and both times the cupcakes rose beautifully but shrunk once taken out of the oven. I am wondering if the baking powder is simply too much? the flavors were amazing, pity more stores don’t carry the pink lemonade…but what do you think? An amazing rise but then the cupcakes shrinking? they still tasted good but I would like them to stay a high cupcake. My girls and I made these today as cupcakes and they were AMAZING! So happy to have found this recipe and it is so easy to make. Hi Whitney, That is wonderful!! Thanks so much for posting your thoughts on the recipe! Can the lemonade cake w/cream cheese frosting be stored at room temp? Hi Alice, because of the cream cheese frosting, you would want to keep it chilled until closer to the time of serving. Can I use two 9″ pans with this recipe and did you sift the flour? Hi Pam, You can use 9 inch pans but your layers will not be as high. I did not sift the cake flour. I spoon the cake flour into a measuring cup and level off the excess with the back of a knife. I hope you will enjoy the cake. The cake came out wonderfully! Wonderful recipe. Personally I would prefer less lemon extract but definitely a recipe I will use again.